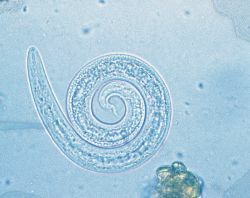 A common genus of lungworm in cats; land snails and slugs serve as intermediate hosts and snail-eating animals can serve as transport hosts. a genus of lungworm of the family Angiostrongylidae; cause chronic cough and weight loss. Includes A. abstrusus (cat), A. falciformis (badger), A. pridhami (wild mink). Occurrence of Aelurostrongylus abstrusus (Railliet, 1898) larvae (Nematoda: Metastrongylidae) infecting Achatina (Lissachatina) fulica Bowdich, 1822 (Mollusca: Gastropoda) in the Amazon region. The feline lungworm, Aelurostrongylus abstrusus (Railliet), was reported from 2 cats from the same household at MCAS Iwakuni. 2000) Nos gatos com sinais respiratorios, a doenca deve ser diferenciada de infeccoes por Aelurostrongylus abstrusus ou Paragonimus kellicotti, asma, cardiomiopatia e outras doencas associadas com dispneia (piotorax, efusao pleural, pneumotorax e anemia) (DILLON, 2007). For instance, the cats that died of HPAI virus (H5N1) infection in Germany were all infected with Aelurostrongylus spp. Most larvae were Angiostrongylus cantonensis (375 to 420 [mean 402] [micro]m in length after fixation in hot alcohol), but a small number of Aelurostrongylus abstrusus (400 to 440 [mean 427] [micro]m in length after fixation in hot alcohol), a lungworm of cats, were also observed.